Despite its small size, the hidden camera includes all the useful features you want for a Wifi camera. 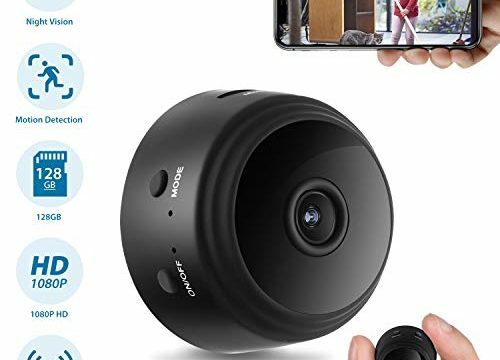 With Wifi connectivity to a 2.4GHz router, you can watch live video feed or playbacks no matter where you are by accessing the BOTOEYE hidden camera APP on phone. 1. 2.4G Router WiFi compatible. BOTOEYE Hidden Camera APP works on iOS device and Android Smartphone/ Tablet. 2. As an alternative, the camera can proceed with Micro SD Card Loop Recording if no router WiFi available. Just insert a micro SD card, typically 32GB (but up to 128GB). 1. Fix the WiFi camera in your home and you can keep tracking of who’s coming and going continuously. The hidden camera can also perfectly act as a babysitter with motion detected push alerts. Or monitor your pets when you are away. 2. Perfect surveillance camera for your office or business place. Check up on your property in real-time. 3. The hidden camera can serve as a car DVR. Adsorb the mini camera on basketball stand to capture your exciting scoring moments. How fantastic! You can use it for more! [Flexible Viewing Choices & Excellent Live Stream Camera]: Acess your camera with the mobile APP anytime and anywhere. After connected with HDMiniCam App, support to view up to 4 live camera feeds on one screen, wherever you are. Keep tracking of what’s going on in every room of your house or business. [Built-in Rechargeable Battery, Also Working While Charging]: Everlasting electricity. Besides the built-in rechargeable battery, BOTOEYE camera also supports recording while charging which allows you to stay connected all the time. Just get the hidden camera plugged into USB charger or power bank for continuous recording. You’ll have peace of mind knowing that you can watch over your valuables by live stream at any time. [Easy To Use]: With the built-in strong magnet, BOTOEYE hidden camera can be tightly adsorbed on an arbitrary iron surface. Using the extra magnetic mount, you can install the camera at any places and adjust the camera in any direction manually. And with the flexible semi-rigid USB cable you can get the hidden camera stand easily. You can also maneuver the cam at any angles or position by the cable as you need.